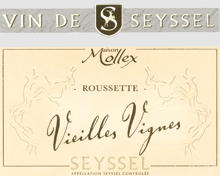 The Mollex family of Pays de Seyssel devotes itself to the culture of the vine and the trade of her wines since 1359. It is the largest vineyard of the Seyssel appellation, that is to say 30 ha of vines, only cultivated with the Altesse type of vine, also called Roussette de Seyssel and Molette type of wine also. Today, it is Jean-Luc and Sebastien who took again the winegrowing and they will be made a pleasure of accommodating you with the cellar for a visit and a tasting of their wines. Superb Seyssel Vieilles Vignes Roussette 2011, vinified at low temperature starting from selected grapes coming from the oldest pieces (more than 50 years), maturing on the lees delicate, typified, charmer and having a nice bouquet, full and persistent, with nuances of ripe yellow fruits quite specific, nervous and dense mouth at the same time. The Seyssel Tacconnière 2011, with the fruit notes with white flesh (pear, peach), of the floral notes (violet, lime) and mineral finally, is perfect on a fresh water fish as on a tartiflette. Remarkable Seyssel Clos de la Péclette 2011, with prevailing of white flowers and nut, of a beautiful persistence, dense in the nose as with the palate, mixing elegance and structure. Their Roussette de Seyssel cuvee La Tacconnière 2010, very slow alcoholic fermentation, not of malolactic fermentation, pale robe but to the silver plated reflections, is a fresh and suave wine at the same time, very pleasant with aperitif or shellfish. The Mondeuse, grounds argilo-limestone and molasses of glacial alluviums, are a reference. Excellent Seyssel Méthode Traditionnelle brut, the second fermentation of catch of foam out of bottle, this one is carried out on slats, for one length of time varying from 18 to 24 months whereas the legislation imposes only 9 months, which will privilege the smoothness of this very nice wine, of light foam, of charming mouth, rich in aromas (almond, peach, flowers…).